Physical exercise is critical to keeping our brains healthy, preventing or slowing the progression of cognitive decline that can lead to dementia, according to the Centers for Disease Control and Prevention. Unfortunately the CDC estimates that only 14% of adults aged 65 to 74, and 4% of adults over 75, exercise regularly. These were the facts Dr. Cay Anderson-Hanley had when she began a study on exergaming and older adults. 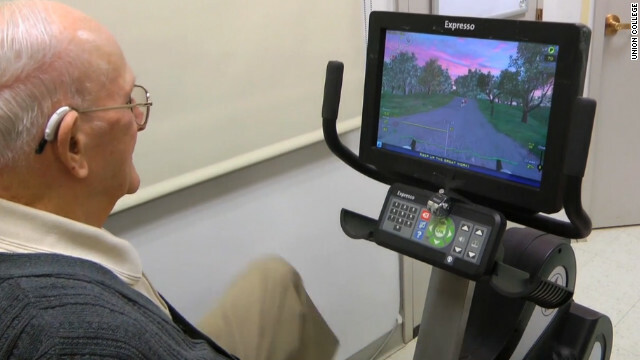 The assistant professor at Union College in New York hoped to determine if exergames - virtual reality games that combine exercise with interactive features - would motivate senior citizens to work out more. What her study found was that exergames have the potential to improve cognitive function more than traditional exercise alone. The results were published in the current issue of the American Journal of Preventive Medicine. The study analyzed the executive cognitive function of 102 older adults from eight retirement communities. Executive cognitive function is higher thinking, like multi-tasking or planning, that helps keep us independent, Anderson-Hanley says. "When it starts to slip, that's when we start to see folks entering nursing homes and such." Study participants were split into two groups, a control group that rode a traditional stationary bicycle and an experimental group that went "cybercycling" with a virtual reality program. Both groups biked for 45 minutes, five days a week for three months. Cybercyclers engaged in interactive elements like navigating virtual pathways or competing with other riders. These elements provided extra stimulation that watching TV or reading while exercising can't, Anderson-Hanley said. The benefit was significant; the cybercycling group experienced a 23% reduction in mild cognitive impairment, compared to the mental benefits experienced by the traditional exercise group. More research must be done to determine exactly what it is about exergames that creates a bigger reduction in cognitive impairment, Anderson-Hanley said. Her hunch is that there's something special about the combination of physical exercise and mental interaction– a synergy of sorts is created. "The neat thing about exergames is that what happens on the screen is driven by what's going on on the bike." For instance, if you want to catch the rider in front of you, you have to pedal faster. "The challenges are uniquely tied." More research must also be done to see if the study's results could be replicated in a larger population and if the cognitive benefits would apply to younger participants. But for now, Anderson-Hanley is optimistic about the possibilities. "We find that these results give us a hope that there is more that can be done to intervene and benefit cognitive health in later life. Finding something like this, we’re not going to cure Alzheimer’s, but it’s another tool in the tool belt that may help slow down cognitive decline and that’s very exciting." The word "exergames" is also used to describe video game systems like the PlayStation Move or the Wii Fit. Researchers have found that the physical benefits from these games are most beneficial to seniors. To learn more, click here. « Previous entryWhat the Yuck: Can you workout too much? I wish my gym had those! There are few things cuter and more endearing than watching old people really enjoy video games. I have found this so true without this article. I had a stroke in '02 and began playing games on computer. Needlesstosay I got kicked out of a lot of games, called names, etc. etc. I kept on playing, though, and I played Literati mostly. It is similar to 'Scrabble' and found I could put all the letters together and form a word. Shortly, I won a game and kept on and on. What I found out is....you do have to excercise your brain. Just play Chess, or Mahjong, all your life. They must not be talking about the places that drug seniors into a numb state to reduce the overhead of actually having to care for people that are awake. I ride an actual bike outdoors and have and "indoor trainer" to which it can be attached to when the weather's too bad. My next ride will be outdoors around 32F, which is preferable to me to riding indoors and watching TV because you encounter the same kind of "games" the virtual game in the article offers. Riding outdoors on popular bike trails that are 8 feet wide means you often encounter other cyclists, walkers with dogs on leashes stretching across the path, etc. in addition to hills where you have to anticipate shifting gears and downhill curves where you have to guard against picking up too much speed. On difference is that, when the temperature is 60F or higher, the nice fresh-air breeze you generate bicycling is very a welcome sensation to your skin. why don't they just use a Wii , like everybody else ??? Exergames is an excellent and innovative gaming material for elders. It keeps them active physically and intellectually. I think brain games work pretty well. Games like braintraining on the DS, I don't think so. You'll just get better at the games instead of improving your actual cognitive skills. The creators themselves admitted that. It's for entertainment purposes. But, if you take a site like http://braingymmer.com with games all based upon neuroscientific research, or another similar site, I think you can actually achieve some nice results with daily training. At least I feel like it's helping for me, and I train about 15 minutes a day. Brain games always boost our brain memory for more details visit our website https://www.braingymmer.com/. Excellent remarkable things here. I am just incredibly delighted to see this page. Thanks a lot so much and i am looking forward to get in touch with you. Can you please drop me an e-mail?